The holidays are now over, but we’re all probably still reeling from ingesting too much food and drink. While I’ve no doubt a lot of us enjoyed a bit of bubbly and other imported libations during the break, there are plenty more who tried to kill their liver with the cheap stuff (which is not exactly a bad thing). Firewater, gut-rot, moonshine, or bottom shelf booze, you can call these brands whatever you want. Just remember that they fill a very important need in our society (to get us totally smashed while keeping our wallets intact). For the uninformed, here are 5 of the more popular brands you should look for the next time you’re a little short. If there has ever been an iconic figure for local booze, the White Castle model would be it. Picture a woman in a red bikini, riding a white horse along a stretch of sandy beach, and you’d have the most well known figure to help boys through puberty to shill for spirits on local television. White Castle Whisky takes a few cues from the then-popular White Horse Whisky, but the similarities remain superficial. Among the local bottom shelf brands, White Castle Whisky may be the most complex and expensive choice, but it can’t hold a candle to whiskies from abroad. Still, for the free calendar price, it can’t be beat, which is why it still sells so well. Also known as bilog and kwatro kantos, this local gin probably outsells all other gins available in the Philippine market. While it works well as a pre-made Molotov cocktail, it’s also a pretty versatile drink. It can be consumed neat or in popular mixes like gin-pomelo. This gin has been around for more than a century, and its taste (and affordability) probably hasn’t changed that much since its inception. A word of warning, it can be a harsh drink for the uninitiated due to its high alcohol content and astringent mouth feel. Nevertheless, it continues to be a favorite among Filipinos all over the country. Tandauy is the brand that made both rhum and calendars of scantily clad female celebrities regular fixtures in sari-sari­ stores. It is more popularly known as lapad, thanks to the wide, flask shaped bottle of its smallest variant. Yes, there will always be those that look down on this rhum, but I’m sure a certain senator will be forever grateful to it for giving us this awesome 2014 calendar. Don’t be fooled by the commercials that feature actors drinking the stuff out of huge brandy snifters. In the real world, more people probably drink Emperador Brandy out of shot glasses, and chased by iced tea. Also known as a long-neck (again, because of the bottle’s shape), this brandy is really cheap at less than a hundred pesos a bottle. While brandy is considered a digestif, and is best enjoyed in moderation, Emperador fans see no reason to follow such silly rules. It’s usually consumed in copious amounts, since doing so doesn’t put too much of a dent on the wallet. I confess that I myself have partaken in drinking sessions where we easily put down six to eight bottles of this hooch, mostly because it’s so damn cheap. Emperador’s popularity has led to many copycat brands being introduced into the market, giving us more TV commercials featuring actors who probably never have, and never will, taste the product they are endorsing. This beer was actually pretty famous in the late 80’s up to the early 90’s. Produced by San Miguel, it was cheaper than their flagship Pale Pilsen, but some would argue that it tasted pretty much the same. While I haven’t seen a Gold Eagle Beer commercial in quite awhile, its tagline “Pang-kundisyon para bukas/sa may ambisyon” (gets you in good condition for tomorrow) is unforgettable since it’s the only beer I know that boasts of restorative powers. Oddly enough, it has become the beer of choice in a lot of provinces exactly because of this claim. A lot of the drinkers out there swear that it gives them a good night’s sleep after a particularly grueling day, and they wake up refreshed the next morning, ready to take on the challenges ahead. If you’re the type to eschew local alcohol in favor of more expensive options at whatever local hotspot is currently trendy, don’t turn up your nose just yet. You’d be surprised to know that almost all bars here use the local stuff for a lot of their mixes, and chances are you’ve unknowingly enjoyed a long-neck or lapad a time or two. While they certainly won’t win any points for class, let’s thank these cheap alcoholic alternatives for getting us nice and buzzed, but not broke. Have you tried any of these brands? Were you a poor engineering student who found joy in getting drunk on gin with just twenty pesos in your wallet too? Let us know in the comments below! Ah, Emperador. That stuff hardened my liver beyond my years when we were drinking it in high school. Good times, but also a lot of bad ones, lol. before emperador, there was don pedro. but emperador was much much cheaper. i (vaguely) remember a summer where we did nothing but drink bottles of the stuff on a daily basis. this is what i feel after drinking Empi and without chaser in HS. the joys of sharing bottles of gin and packets of happy peanuts with your friends. while having just twenty pesos each. if you’re lucky, someone springs for sisig. good times. is Gold Eagle available in Manila? I havent tried that. Beer na Beer meron. This post reminded me of Dolphy’s Banayad Whiskey! So funny! I once ordered a Cuba Libre in The Reserve, at Ortigas. The bartender wasn’t mixing in Bacardí; he whipped out the Tanduay instead! White Castle surprised me when an ex-pat friend of mine broke out a bottle. My Filipino friends only drank San Miguel gin, which is very drinkable. I have Filipino friends who swear by Emperador Lite –I’m not a brandy drinker, but this was also good. 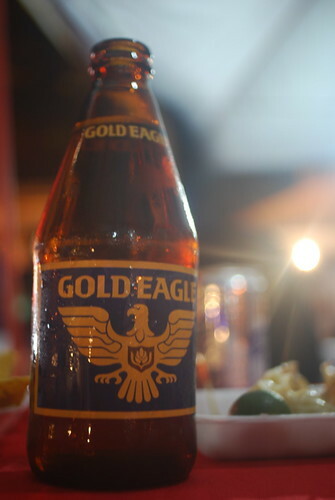 You know you’re in the province when Gold Eagle is for sale, which I prefer to San Miguel pilsen. The one drink here I don’t like is the Tanduay 5 year. How much of their prices has changed over the course of, what, a year or two?